The Chamber Choir of London's new single has recently been released, the latest in a series of monthly singles which the choir is releasing. 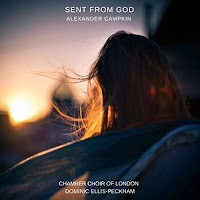 Conducted its music director Dominic Peckham, the choir performs Alexander Campkin's anthem Sent from God, a striking a cappella piece which mixes tonal contemporary idioms with some rather interesting chant-influenced writing. There are hints of John Tavener in the choral writing, but the use of a solo soprano line in dialogue with the full choir creates a very striking effect. As ever, the choir gives a lovely vibrant and focused performance, attacking Campkin's writing with straight, direct tone. Further details from iTunes or from Amazon.